Bed rails are usually metal rails that hang along the side of a bed, and they are often used in nursing homes to stop an elderly resident from leaving the bed or falling off the bed and getting hurt. Bed rails often help elderly people in getting in and out of bed or when trying to adjust themselves in the bed. When a patient is strong enough to move on his or her own, a bed rail can be a safe convenience. However, bed rails are not safe for all nursing home residents. In some cases, they are not used with the right bed and mattress, while in other cases, a resident is too disoriented to use the railing safely. A Chicago bed rail injury attorney can advise you if a loved one was injured in a nursing home as a result of a bed rail safety issue. At Moll Law Group, our nursing home negligence attorneys can determine whether you may have a claim. Bed rails need to be used with an appropriate bed and mattress, but there are few regulations regarding this issue. In some cases, nursing homes move beds or reassemble them such that bed rails are used with the wrong mattress. When bed rails are used with the wrong bed and mattress, or on a bed for a resident who is highly medicated or disoriented, they carry a risk of restricting an elderly resident's breathing. Nursing home residents can get trapped between the rails and mattress, and they may not be strong enough to pull themselves out of that space. They can sink too far into the space and lose the ability to breathe. They may then die by asphyxiation or cardiac arrest. In other cases, a resident may try to roll over the rail and fall, which can lead to fractures or broken bones. If a loved one is injured or dies due to a lack of bed rail safety, you may be able to enlist a bed rail injury lawyer in Chicago to file a lawsuit for compensation against the nursing home under the Illinois Nursing Home Care Act. The Act is a state law that prohibits abuse and neglect in long-term care facilities, including institutions and private homes that offer nursing for three or more people not related to the owner. By filing under the Act, you may recover many forms of relief, including medical bills, pain and suffering, fees and costs, and an injunction ordering that more care be used when fitting bed rails to mattresses and beds. You may also have grounds to file a lawsuit based on causes of action such as wrongful death, negligence, breach of contract, medical malpractice, or product liability. You have only two years from the date of an injury or death to sue for personal injuries or wrongful death. 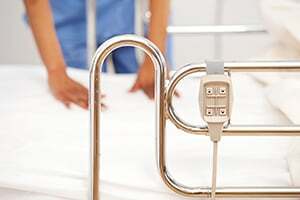 If you or an elderly loved one was harmed due to a lack of bed rail safety, the Chicago bed rail injury lawyers at Moll Law Group are available to pursue a claim for compensation against the nursing home and other responsible parties on your behalf. We are committed to pursuing justice for injured people in Wheaton, Naperville, Schaumburg, and communities throughout Cook County. Billions of dollars have been recovered in cases in which we have been involved. Contact us online or at 312-462-1700 to set up a free consultation with an injury attorney.